For all the indifference in constitutional affairs that the federal government had shown in the post-Meech hiatus, the ink was hardly dry on the Charlottetown Accord that prime minister Brian Mulroney (pictured) was in the House of Commons, beseeching honourable members to quickly approve the new 60-point agreement. A rare deal was reached between House leaders to limit debate to 15-minutes per speaker. The referendum question was approved in just three days, to be put to the people a mere 47 days later. On September 8, 1992, confident in the support of opposition leaders Jean Chretien and Audrey McLaughlin, all 10 provincial premiers, the chief of the Assembly of First Nations and two former prime ministers, Mulroney led off with a bang. RIGHT HON. 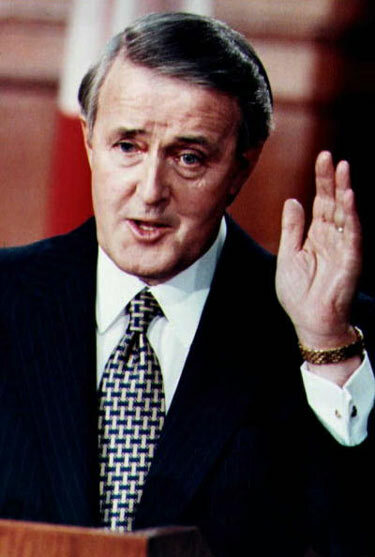 BRIAN MULRONEY - Prime Minister (Charlevoix): Mr. Speaker, this Agreement is the result of the most far-ranging and thorough process of consultation and discussion ever held by a Canadian government, and perhaps by any government in a modern industrialized world. For the aboriginal people, it proposes a new partnership in a federation that was created in 1867 without their participation. This generation of Canadians are now called upon to redeem the promises of equality first made to the aboriginal peoples several hundred years ago by representatives of French and English kings and never fulfilled. We propose to fulfil those obligations in the year 1992. In 1608, French was already spoken in Quebec City. In 1763, when Canada was ceded to England, the 90,000 French people living here openly feared for their future. Long, long before Confederation, the ancestors of this country called themselves "Canadian", a name that generation after generation of pioneers bore with pride. This Agreement, Mr. Speaker, enables a new generation of Quebecers to say "yes" to Canada with pride and confidence. We are faced today with the imperative duty of closing the circle of this constitutional round and getting on with the important work of readying Canadians to meet with the important work of readying Canadians to meet the sweeping demands of global competition and profound societal change that we find everywhere. Our history begs us to proceed and the world around us reminds us that we must. It is time for us all to find it in our hearts and in our souls to say without hesitation or doubt that a yes to Canada, a yes to this agreement, a powerful yes to liberating future generations of Canadians, for decades and decades to come, to achieve, to grow, to prosper, to share and to care in a manner the world has come to know as the Canadian way. Less than twenty-four hours later, the Speaker recognized an honourable member sitting deep to his left. LUCIEN BOUCHARD (Lac St. Jean - pictured): Mr. Speaker, the Prime Minister has been extolling the so-called virtues of the Accord, rallying to his cause the leader of the official opposition, his new friend, and dead sovereignists. I would like to give the prime minister an opportunity to confront a real live sovereignist. I ask him to accept the challenge of meeting me in public debate in Quebec, anywhere and at any time during the referendum campaign. MR. MULRONEY: Mr. Speaker, I am a real live Canadian, and I brought one into this world. For months, the leader of the Bloc Quebecois has been insisting on public consultations. Well, there is going to be a referendum in Quebec and on October 26, you will know the outcome and what Quebecers really think. 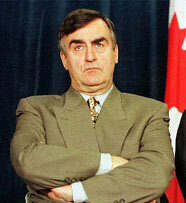 LUCIEN BOUCHARD: Mr. Speaker, I think who brought who into the world is beside the point. I want the prime minister to say whether he will accept my challenge, yes or no. AN HON. MEMBER: He is scared! MR. MULRONEY: The last challenge I accepted was in 1988, when I went twice to the riding of Lac St. Jean, with my wife, to get my hon. friend elected! There will be not one but many debates in Canada and Quebec, because when the Bloc Quebecois and the Parti Quebecois were asking for a referendum, they said it had to be a referendum on sovereignty. MR. BOUCHARD: So let's have one! MR. MULRONEY: I think I can hear the Bloc murmuring in the background. I can assure you that there will be a watertight question and a decisive outcome. Considering the commitment made by the leader of the Bloc, I assume that if the vote is not in his favour, he will do as he said and resign the next day. This unexpected spat between the two former friends and political colleagues was a fascinating interlude. But so overwhelming was the blossoming referendum debate, that it was virtually ignored by the national press. The sand-clock was turned over and members of Parliament retreated to their ridings to attend their constituent's rendezvous with history, an appointment which would see 55% of Canadians reject the Charlottetown Accord.